The Sea The Sea's Mira and Chuck Costa will perform at the Coconino Center for the Arts on Feb. 14. "I think Chuck and I, at our core, just really love songs," Mira Costa (right) said. "As artists and audience members, we like songs that you can enjoy on a totally surface level or a total deep dive." It’s only been a few weeks since the New York-based indie-folk outfit The Sea The Sea returned from their last tour, but Mira and Chuck Costa are already back on the road. While the album was written with a band in mind, at the center of “From the Light” are Chuck and Mira’s voices and songwriting prowess, their soothing harmonies and lyrical imagery. 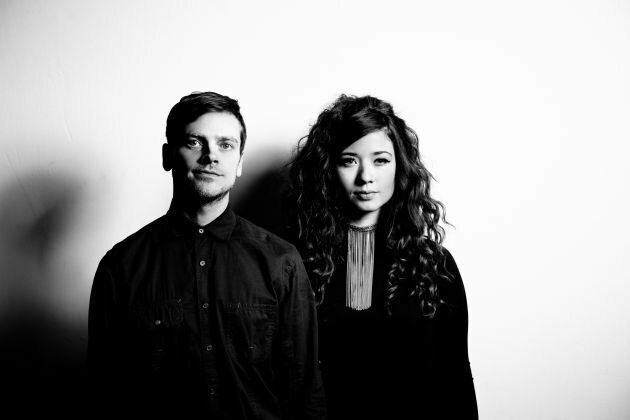 The Sea The Sea’s current tour, which brings them to the Coconino Center for the Arts for a special Valentine’s Day performance, will see Mira and Chuck as they first started off — a duo. “I think we feel most in our wheelhouse and most connected to each other and with the audience when we’re playing in duo form right now, which has made for some really exciting shows,” Mira said. “When the two of us are real connected, that’s when we connect with the audience the most, and that’s why we do this, connecting with people,” added Chuck. Before embarking on this tour, which will take them from Arizona to Massachusetts, Mira and Chuck, have been reimagining a few songs off of “From the Light” as duo pieces, as well as working on new material. Take their song “Ricochet,” a song that sits on a bed of digital drums and pads and hits hard during its choruses. Rewriting it to fit the duo with just an acoustic guitar and sparse electrical guitar parts, the song is “smoothed over into something that becomes more conversational,” Chuck said. Mira and Chuck approach songwriting in multiple ways. In one, they’re looking at it as an audience member. Can the song entice a listener with its music, its surface level arrangements? Then, for someone who’s looking for something deeper or something to connect to, can the song capture a feeling without strictly dictating how one should feel? The Sea The Sea, in both their albums and their handful of EPs and singles, find a way to sift between the two modes of listening, capturing us with their harmonies and dramatic compositions then keeping us in their sonic landscape with lyrics that stir our imagination and allow us to see our own stories in their music. The song “Waiting” from their 2014 debut album, “Love We Are We Love,” explores this duality. From their lyrics to their album art to the music video for “Waiting,” which was animated using 3,453 oil paintings by Zachary Johnson, the visual component is as important as the sonic. “Whenever we’re writing something, the goal is to be transported, for it to take you wherever that song is happening, that emotional space. And if you can paint the landscape around it, I think that helps,” Mira said. What makes this Valentine’s Day performance even more special is Mira and Chuck’s history. Having met at a musical festival in West Virginia, what started as a potential musical collaborative project slowly evolved into a romantic relationship. Or was it the romantic interest first? The Sea The Sea will perform at the Coconino Center for the Arts, 2300 N. Fort Valley Rd., on Feb. 14 for a special Valentine’s Day concert. Doors open at 6:30 p.m. when attendees can partake in chocolate and wine tastings. Concert begins at 7:30 p.m. Tickets are $20 in advance, $22 day of, and can be purchased at CCA, Arizona Music Pro, online at www.flagartscouncil.org and by calling 779-2300.